The TCM uses the signals from the throttle position sensor, air-flow meter, turbine (input) speed sensor, output speed sensor and crankshaft position sensor to monitor the engagement condition of the lock-up clutch. The TCM compares the engagement condition of the lock-up clutch with the lock-up schedule in the TCM memory to detect shift solenoid valve SLU, valve body and torque converter mechanical problems. Lock-up does not occur when requested. 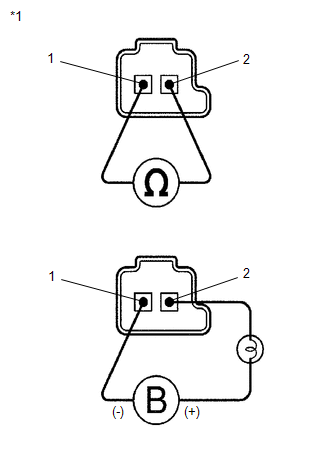 Transmission fluid pressure switch No. 3 is OFF. Transmission fluid pressure switch No. 3 is ON when lock-up does not occur. Lock-up occurs when shift solenoid valve SLU is requested to turn on in the lock-up range. Torque converter lock-up is controlled by the TCM based on the turbine (input) speed sensor NT, output speed sensor NC, engine rpm, engine load, engine temperature, vehicle speed, transmission fluid temperature, and gear selection. The TCM determines the lock-up status of the torque converter by comparing the engine rpm (NE) to the input turbine rpm (NT). The TCM calculates the actual transmission gear by comparing input turbine rpm (NT) to output shaft rpm (NC). When conditions are appropriate, the TCM requests "lock-up" by applying control voltage to shift solenoid SLU. When SLU is turned on, it applies pressure to the lock-up relay valve and locks the torque converter. If the TCM detects no lock-up after lock-up has been requested or if it detects lock-up when it is not requested, the TCM interprets this as a fault in shift solenoid valve SLU or lock-up system performance. The TCM will turn on the MIL and store the DTC. When any of the following is met, the system judges it as a malfunction. There is a difference in rotation (speed) between the input side (engine speed) and output side (input turbine speed) of the torque converter when the TCM commands lock-up. There is no difference in rotation (speed) between the input side (engine speed) and output side (input turbine speed) of the torque converter when the TCM commands lock-up off. OFF malfunction (a): 3.5 sec. OFF malfunction (b): 0.05 sec. ON malfunction (a): 1.8 sec. ON malfunction (b): 0.6 sec. The following items are common to all conditions below. Input speed is equal to engine speed when lock-up is ON. Control the shift solenoid SLU and SL to set the automatic transaxle to the lock-up condition. Can be used to check SLU and SL solenoid operation. This test can be conducted when the vehicle speed is 60 km/h (37 mph) or more. (h) Lightly depress the accelerator pedal and check that the engine speed does not change abruptly. When changing the accelerator pedal opening angle while driving, if the engine speed does not change, lock-up is on. If any other codes besides "P2757" are output, perform troubleshooting for those DTCs first. (a) Remove shift solenoid valve SLU. (a) Check the torque converter assembly (See page ). The torque converter operates normally.